Béar Féile, Ireland’s biggest bear festival organised by the Dublin Bears, takes place from today, Thursday, 26th March until Sunday, 29th. Registration takes place this evening the 26th at Nealon’s Bar on Capel Street (Dublin 1) from 5pm until 9pm, when the meet & greet takes place. At 10pm, the crowd will move onto Bridie’s Bar, part of The George on South Great George’s Street (Dublin 2). 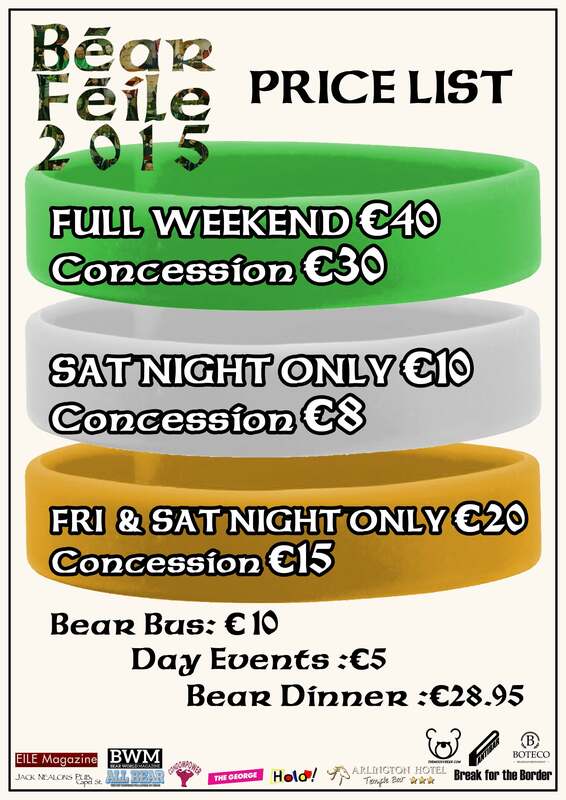 On Friday, Registration continues at Nealon’s Bar at 3pm, ahead of a tour of the Lepreachaun Museum at 4pm. A traditional music session (or ‘seisiún ceoil’) takes place back in Nealon’s alongside DJ Aggy, before the crowd moves to the Arlington Hotel, Temple Bar, for a Bear Dinner (Cost: €28.95). The evening’s entertainment continues at the Arlington with the talented Paul M (EILE’s Jannuary ’15 cover star!) and DJ Steobear wooing the crowd. Saturday sees a guided bus tour around Dublin at 12.30pm for just €10, picking people up at Pantibar on Capel Street. At 3pm, On The Game takes place at Nealon’s, ahead of the annual Mr Bear Ireland grand finals, with Panti, WOLF and DJ Corky in Break For The Border from 9pm. The final day of Béar Féile is a wind-down of the festival, with a fun Viking Splash Tour at 12.30pm. After that, it’s nothing but good fun as the crowd joins Dolly Grip in Pantibar, before heading across the river for some Bear Bingo with Shirley Temple Bar at the George. For more information, you can visit http://www.dublinbears.ie where you can also book your tickets for the Bear Dinner. ← Don’t Miss! Béar Féile’s Welcome Night Tonight At The George 10 pm! !